There is so much to this sport we love, not least of which is pushing our boundries and understanding. 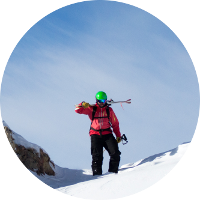 Having your equipment in top condition and knowing the danger signs when you head off the beaten track are essentials to anyone serious about the mountains. 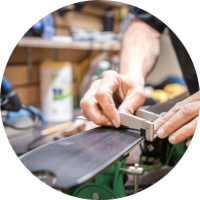 We run ski tuning and avalanche safety workshops throughout the year, if you don’t see a date that works for you please get in touch. 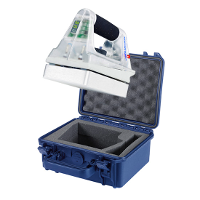 We can also give one to one training in your workshop at home both for hand servicing, and using machines such as the Wintersteiger Discman. Contact us for pricing. A Wintersteiger Discman sharpens your edges, razor sharp. The best waxes from Holmenkol, fast running and chosen for your needs. Hand ironed, digitally controlled to ensure deep penetration. Horsehair brush to leave the surface smooth and silky. Can be added to any of our other services. Please contact us to arrange getting your skis to us to service either by email or Whatsapp. We can usually meet you at Chill Factore or nearby. Pickup can be arranged from you for a small extra change dependent on mileage. No extra pickup charge for multiple skis or snowboards at the same time. Turn around is usually 48 hours.